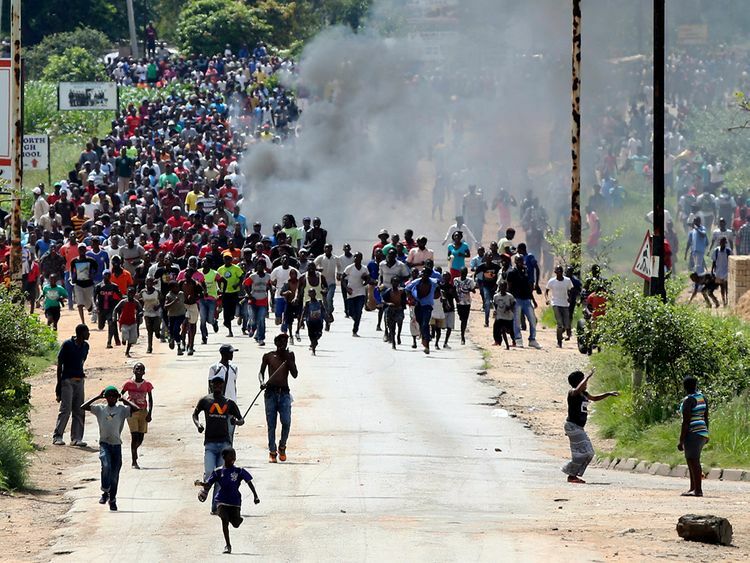 Harare: Violent protests in Zimbabwe claimed lives on Monday as soldiers were deployed after the embattled government more than doubled fuel prices, sparking widespread anger. Protesters burnt tyres and barricaded roads while cars were torched as demonstrations turned violent in the capital Harare and Bulawayo, Zimbabwe’s second city. Ncube did not give numbers or the identities of the dead, but said investigations were underway. At least 13 people had sustained gunshot wounds in and around Harare, the Zimbabwe Association of Doctors for Human Rights said. President Emmerson Mnangagwa announced the shock price hikes for petrol and diesel on Saturday in a bid to improve supplies as the country battles its worst gasoline shortages in a decade. Residents in Bulawayo said police fired teargas “indiscriminately” in the city centre and some residential areas. Shops and banks pulled down their shutters in downtown Harare as riot police patrolled the streets and a military helicopter flew over the capital. Several cars were torched. As night fell, dozens of soldiers were deployed in both cities, reporters saw. Nkululeko Sibanda, spokesman for the opposition Movement for Democratic Change party, said their headquarters in Harare was attacked late in the evening. Firefighters extinguished the blaze. No injuries were reported but the front of the building was destroyed, Sibanda said. Budget airline Fastjet cancelled flights to and from Harare “due to the current unrest affecting travel on the streets of Harare”. Protesters turned back drivers and stopped buses from carrying passengers in the two main cities. An AFP journalist saw protesters looting a supermarket in Bulawayo. At least 200 people have been arrested, the security minister said. In his televised address late Saturday, Mnangagwa said the price hikes were aimed at tackling a shortfall caused by increased fuel usage and “rampant” illegal trading. Petrol prices rose from $1.24 a litre to $3.31 (2.89 euros), with diesel up from $1.36 a litre to $3.11 starting Sunday. Speaking during a working visit in Russia on Monday, Mnangagwa said the increase “was necessary and still is”. In an apparent admission that the country’s quasi currency is a worth a fraction of the US dollar, Mnangagwa said the $1.24 pump price as of last week was the equivalent of between 50 and 60 cents per litre. Government spokesman Nick Mangwana in statement late Sunday accused the strike organisers of pushing a political “regime change” agenda and of “subversive political activities”. “The prevailing security situation in the country is a culmination of a well-orchestrated series of events by the (opposition) MDC Alliance working in cahoots with NGOs, civic society, youth organisations, pressure groups and individuals,” the security minister said. But the leader of the main opposition MDC, Nelson Chamisa, said: “We have a national crisis which is descending into a humanitarian crisis”. Mnangagwa took over from long-time ruler and autocrat Robert Mugabe following military intervention, before winning the presidency in a disputed July election.